Today’s blog post by YaJagoff Podcast co-host, Rachael Rennebeck, while John is somewhere breaking his first resolution dunking oreos in a vat of milk. This blog started anonymously about jagoffs six years ago. Then a book was added as well as a weekly video series. 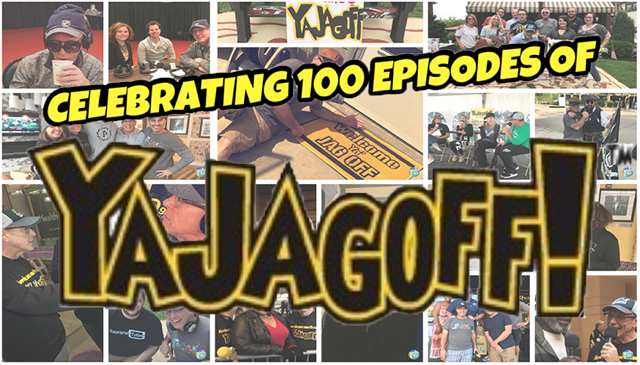 Now YaJagoff.com is celebrating its latest milestone, episode 100 of the YaJagoff Podcast! This esteemed honor requires both a Pittsburgh party and a top 10 reasons why you should attend and not be a jagoff attendee! The celebration will be at the Foundry on the North Shore on Thursday, February 1 with doors opening at 6:30 p.m. Tickets are $25 and include light fare finger food, jagoffery with special guests and a podroast! Oh, and please add the words Ya Jagoff to the end of each number! 10. There is parking close to the Foundry—but try not to double park. 8. It is the day before Pennsylvania’s claim to fame: Groundhog Day—isn’t that some kind of something? 4. Grab a napkin and utensils when eating! 3. Sip on a jagoff cocktail, but no belching, burping, even hiccupping! 2. Rub elbows with special guests, but not literally. 1. Enjoy the PODROAST of yours truly! Celebrate 100 episodes with fun guests, games, food, cocktails, audience interaction and a comedic roast of yours truly thanks to Day Bracey, Matt Light, Gab Bonesso, Ray Zawodni, Aaron Kleiber, John’s son Collin Chamberlin and Ya Jagoff team member John Knight. Get your tickets to the show/food/fun here! Previous article#YaJagoff Podcast / The Episode After the Christmas One “Not Your Average NYE—It’s A New Year’s Expo and for Hockey!